Can You Get Funding with a Bad Pitch Deck if your Startup is Good Enough? Wondering if a good startup can get funding with a bad pitch deck is a bit like asking “Which came first, the bad pitch deck or the bad startup?” Well, it’s kind of a tough one to answer. A chicken and the egg problem. It’s all a little intertwined. Can you even have a bad pitch if your startup is good? Can you have a good, successful startup without having had a good pitch that you gave at least to your customers/team members? What about the deck itself? Maybe the company is just knocking it out of the park, but has no Powerpoint skills. Possibly. But, in my experience most really stellar startups that get funded see the value in a high quality pitch deck. They invest time, energy, and money into it. They don’t wait until the last minute and they do it right. Let’s say you did have the greatest startup in the whole world. You may say “Hey! the greatest startup in the world is… UBER… AirBNB… [Your Favorite Unicorn here]…” Those are giant companies now, can we call the startups anymore? I’m not so sure. So let’s say it’s you, not Travis Kalanick, that has the greatest startup in the world. What does that look like? There are a lot of customers willing to spend a lot of money on what you have to offer. The market is only growing and getting bigger over time and expected to continue. You built this thing, You tested it and fine tuned it. It totally does everything you say it will and more. The code / design / process is iron clad. You have some unfair advantage that makes you and your company able to capitalize here where no one else can. You have a patent or a well-kept trade secret. You have a strategic partner or giant flagship customer. So with this awesome-sauce covered company, we are proposing that you could have the worlds worst pitch deck and still get funding. For my engineers out there: our hypothesis is the quality of the pitch required is perfectly inverse to the value of the startup. A solid pitch deck is an invaluable tool when communicating with and convincing mentors to join your advisory board. It tells stakeholders in a succint way a) this is what we’re doing b) here’s why we can do it and c) here’s why you should help us. It is equally valuable at distilling this information in order to acquire your first team members and foster important partnerships. Draw to it world-class motivated mentors and team members despite a lack of clarity of the message and a clean, clear document to convey this information. Maybe this will work, but it will take longer, and it will take more meetings, and some key people may be missed. Ok so let’s say we were able to get stellar mentors and awesome team members already. If we need funding to grow and build this company, we need to talk to some investors. Most founders don’t just have a big Rolodex full of investors ready to write a check, so somehow we need to either cold call or contact these investors. Being introduced by a mentor, contact or other investor is a great warm-lead way to do this. A warm lead usually fully understands you business and know an investor who invests in similar deals. To preserve the integrity of their relationship with the investor, they often which to forward collatral, like a pitch deck, for the investors review and go-ahead prior to handing out their email / contact information. Convey value and market opportunity to the contact effectively so they can feel confident it is a deal that their investor contact would find valuable. After that they’d need to be ok with sending a flat intro email with no further information other than their own words and sharing email addresses. Ok, maybe you know them well and this makes sense, maybe you get past this stage without a solid pitch deck. After you get your pitch deck or collateral into the hands of an investor or an investor group, someone will need to review your pitch deck and decide if having a further conversation with you makes sense. If you cold-called this investor, the bar is higher, if you were a warm lead, you have the benefit of the contact’s approval to some extent. At busy investor groups, the “stack” of emails containing pitch decks can be so high that the investors hire a pitch reviewer to make important cuts to ensure they don’t waste their limited time talking to opportunities that do not fit their investment goals. The pitch reviewer (much like the recruiter with resumes) is looking through so many of these. The ones that are professional, clear, and tell the story well, stand out, get read for longer or even get read at all. Somehow skirt this whole process. With a bad pitch deck, this is where the buck stops. If your deck can’t convey the value of your company, the size of the market that is there, and how you’re going to be able to achieve it in a professional, visually stunning way, it’s not going to stand out, it’s not going to get read, and you’re not going to get the meeting. So for the sake of argument let’s say that you rode on the coattails of the contact who introduced you to the investor. Their relationship or opinion was valued so highly that the investor agreed to met you in person to speak more without anything else. No investor is going to invest thousands or millions of dollars in your company on a pitch deck alone. All of the documentation in the world will not overcome the fact that people invest in people. Who you are, and your relationship with the investor will greatly affect if your get funding from them. The pitch deck you sent to them is just to get you in the door, next you need to meet them in person. Sometimes these meetings are relaxed and conversational, sometimes you will pitch live, sometimes you’ll stand in front of a projector / LCD TV with your live pitch presentation behind you. You’ll need to have a clear message around what you’re doing, and be able to use the limited time you have to convey that information as thoroughly and engagingly as possible. A stellar pitch deck supports your presentation. It doesn’t distract your audience from you. Slides that are confusing, full of too much text, or are otherwise unprofessional will distract the investors and take away from your success. This is the time to knock it out of the park, the time to impress, the time to make them feel like a) they would be missing out if they passed on this deal, and b) you are the humble, qualified, team builder that can make this happen. Nothing can be done at this stage with the worlds worst pitch deck. This is the make or break moment, and if the pitch is not clean, succinct, and impressive, those investors have a lot of other opportunities to invest in. After you get a lead investor on board, you often need to fill out the rest of the raise. So once you make it past all of the other hurdles, it’s still possible to lose your funding round simple because the investors you have on board don’t wish to cover the full amount you are seeking, and you are unable to close the round out. To fill out a raise you need to convince several investors to join in on investing in your company. Your current investors likely know others who would join them, but just as in the 2nd Hurdle “Introductions to Investors,” you’re going to need professional and effective collateral that the investors can share with their colleges. Sounds like a lot of opportunities to fail. To be not quite good enough. To lose out on an opportunity due to a lack of message, clarity, and attention to detail. To not impress the right investors and stakeholders enough to get the benefit of their assistance, connections, and funding. So if we’ve established that the worlds best pitch deck still needs a stellar pitch deck in order to be successful, what does that mean for your startup? Putting together a compelling and professional pitch deck can feel overwhelming and seem time consuming. Preparing for an in person pitch can make you feel insecure and nervous. Do not fear. Pitch Deck Fire has been a light for hundreds of founders seeking funding.  Our pitch experts and high quality designers can put a fire in your fund raise and help you get funding faster. We offer high quality pitch deck design services that walk you through putting together your best pitch, as well as one-on-one pitch review and coaching to help you fine tune / perfect a deck you’re already been working on.